CIC applied for the Conformity Assessment according to ECN-QAS. 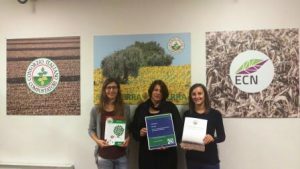 The audit of CIC for conformity assessment was carried out by supervising an audit with sampling taking on the composting plant of Biofactory spa (www.biofactoryspa.it) on 16 October and by supervising CIC’s quality assurance scheme in the CIC’s office on 17 October 2017 in Cavenago. ECN quality manager Stefanie Siebert carried out the audit. In the picture from left to right are Dr Jenny Campagnol (CIC Quality Manager), Dr Stefanie Siebert (ECN, QUality Manager) and Dr Vera Brambilla (CIC, Quality Manager).